Which additional software can I install in Tails? Tails includes a limited set of applications but you can install more software. This software is distributed in packages that are made available from the Debian repositories, which are similar to an app store. Set up an administration password when you start Tails. Choose Applications ▸ System Tools ▸ Synaptic Package Manager. Wait until Synaptic finishes downloading new package information from the Debian servers. Browse the packages by sections from the left sidebar. Search on titles and descriptions of packages with the Search button. Search the Internet for alternatives to other software. For example: "debian alternatives to photoshop". Ask a friend who is knowledgeable about Linux. The packages included in Tails are carefully tested for security. Installing additional packages might break the security built in Tails, so be careful with what you install. Packages that use the network need to be configured to go through Tor. They are otherwise blocked from accessing the network. Some software might, for example, modify the firewall and break the security built in Tails. But other software like games or office tools are probably fine. Software not officially included in Tails might have not been tested for security. We also cannot provide support or documentation for it. Only applications that are packaged for Debian can be installed and they are under public scrutiny. Click Search and search for the name of the package. Right-click on the name of the package in the search results and choose Mark for Installation. Synaptic calculates the additional changes for your package to work. Click Mark to confirm those changes. Click Apply to download, install, and configure the package. If you are comfortable with the command line, you can use the apt command instead. To do so, you need to enable the Additional Software persistence feature. 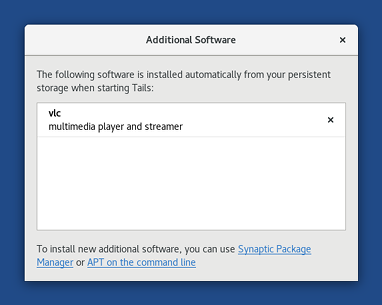 After a package is installed using Synaptic or apt, a notification appears to ask if you want to install this package every time you start Tails in the future. 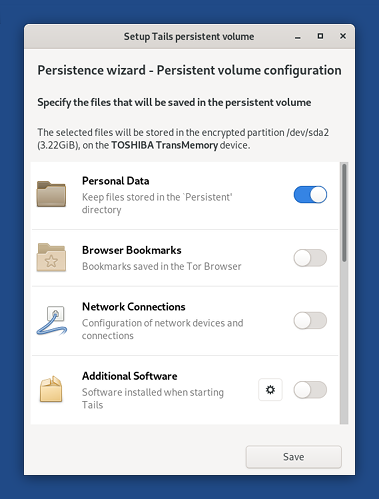 If you choose Add to Persistent Storage, the package is saved in the persistent storage and will be reinstalled automatically every time you start Tails. The package will also be updated automatically when you connect to the Internet. If you choose Install Only Once, the package is also saved in the persistent storage but won't be reinstalled automatically every time you start Tails. The same package can be reinstalled faster for some time because you won't have to download it again. Some packages require additional configuration to work. To keep the configuration across Tails sessions, you can use the Dotfiles persistence feature. To see which packages are installed automatically every time you start Tails, choose Applications ▸ System Tools ▸ Additional Software. Click the button to remove a package from the list. The same list is also available from the configuration of the persistent storage, by clicking on the button of the Additional Software feature. Install Only Once, you can remove it by restarting Tails. Choose Applications ▸ System Tools ▸ Additional Software. Click the to the right of the name of the package. Right-click on the name of the package in the search results and choose Mark for Removal. Click Apply to remove the package. From the command line using apt. After the package is removed, a notification appears to ask if you want to remove this package from your list of additional software. Choose Applications ▸ System Tools ▸ Root Terminal to open a Root Terminal. The packages available in Debian are submitted to public scrutiny. Configuring additional APT repositories might break the security built in Tails and might install software that has not even been approved by Debian. Be even more careful with what you install. This step is usually not needed to install additional software and might be necessary only in very rare occasions. File names must end with .list and may only contain the following characters: letters, digits, underscore, hyphen, and period. Restart Tails to apply the changes.